Pfc. Bowe R. Bergdahl, 23, was serving with an Alaska-based infantry regiment earlier this month when he vanished, just five months after arriving in Afghanistan. The heartbroken parents of the U.S. soldier captured in Afghanistan broke their silence to urge the nation to pray for the return of their beloved only son from the clutches of the Taliban and back to the small Idaho town where he grew up, as ABC News reported the abducted soldier may have been moved to a lawless region of Pakistan. Pfc. Bowe Bergdahl, 23, was captured two weeks ago thousands of miles from the gravel driveway he used to bike down in Hailey, Idaho, and said in a chilling video released by the Taliban over the weekend he feared he would never return to the home he loved. "Please, please bring us home," he begged in the video that showed him with a shaved head, wearing local attire. In the 28-minute clip, Bergdahl is shown with his head clean shaven but a scruffy beard on his face. 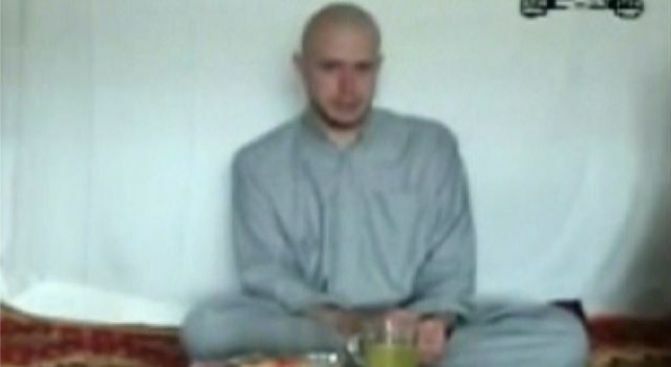 He is pictured eating and drinking tea as his captors speak to him off camera. "I am scared. I'm scared I won't be able to go home," he said in the tape. "I have my girlfriend who is hoping to marry. I have my grandma and grandpas. I have a very, very good family that I love back home in America." Friends and family in the close-knit mining town of 7,000 are slowly opening up about Berghdahl after the Pentagon confirmed the soldier's identity following the release of the chilling 28-minute video. The clip prompted his family to issue a statement asking people to pray for the captured soldier. "We've been overwhelmed with the outpouring of support and concern towards Bowe and our family," read the statement. "As you know, the situation is extremely difficult for everyone involved. We'd like to remind all of you our sole focus is seeing our beloved son Bowe safely home. Please continue to keep Bowe in your thoughts and prayers, and we ask for your continued acceptance of our need for privacy in this difficult situation. Thank you." Bowe grew up in Blaine County where he was homeschooled and learned ballet for several years. "He's athletic," said Jill Brennan, director of the Sun Valley Ballet School, according to the New York Daily News. "He just had a knack for it. He's a wonderful young man." The family, reportedly very private, lives about six miles west of Hailey on a remote gravel county road. Out front, a cardboard-and-ink placard wired to the locked front gate reads "No visitors." Before enlisting in the Army in 2008, Bergdahl poured espressos at Zaney River Street Coffee House, where owner Sue Martin posted a sign with a yellow placard taped to the front window that reads "Get Bowe Back." She posted it only after she had permission from the family and has kept vigil there since. On July 2, two U.S. officials conceded a soldier had "just walked off" his base near the border with Pakistan with three Afghans after his shift, but wouldn't release details. Four days later, the Taliban claimed "a drunken American soldier had come out of his garrison" and was captured by mujahedeen. Defense officials speculated Bergdahl may have wandered off to visit a female and hinted he may have had past behavioral problems, according to ABC News. In an interview with ABC, Secretary of State Hillary Clinton said the U.S. is doing all they can to bring the beloved soldier back home. "We are attempting to do everything we can to locate him and free him," Clinton said. "It's just outrageous. It's a real sign of desperation and criminal behavior on the part of terrorist groups." Bergdahl was serving with a unit based in Fort Richardson, Alaska, earlier this month when he vanished, just five months after arriving in Afghanistan, officials said. He was serving at a base near the border with Pakistan in an area known to be a Taliban stronghold. Citing two sources involved in Bergdahl's search and three Afghan soldiers captured with the soldiers, ABC News reported that an Afghan insurgent leader has boasted of transferring Bergdahl to South Waziristan in Pakistan. That leader, Mullah Sangeen, has demanded that the U.S. end air raids on Pakistani targets in return for Bergdahl's release, according to the report. Pentagon officials told ABC News they still believed Bergdahl remained in Afghanistan.